This Choir Girl is heading out east! Actually, Ottawa, to be more exact. That is where Podium 2012 is hosted this year, which is the annual Canadian Choral Conference from May 17-20, 2012. I expect these four days to be filled with excellent music, engaging dialogue, and ample opportunity to geek-out as choral music enthusiasts attend sessions and concerts together. While I have sung at two Podium conferences in the past (Edmonton (2000) and Victoria (2006)), this will be my first year singing, blogging, and formally attending the sessions. It’s going to be a bit of a balancing act; I’m not expecting to get much sleep. In order to make the weekend more manageable, I reorganized the weekend schedule to visualize trends and group activities. It is my attempt at a qualitative analysis of the weekend schedule. How does one begin scheduling a plan of attack in order to conquer the sheer multitude of choral sessions? A top five priority list? Agreeing to some pre-determined session hopping? Peer pressure? No matter what the plan is, there is much to learn and no right way to go about it. It’s a choose-your-own-choral-adventure type of situation! Aside from attending a wide array of sessions, I feel like the best way to learn and experience what this country has to chorally offer is to attend the concerts. This is where I plan to spend the bulk of my time. Please excuse my inherent bias, since I am a Choir Girl of Belle Canto, but not only are we the only choir representing Western Canada this Podium, but we also get to share Thursday’s concert with the Estonian treble choir, Tartu Ülikooli Akadeemiline Naiskoo. I’ve been following their updates on social media, and even though I cannot read Estonian, I feel like we’re choral-kin already. It will be noteworthy to see the MacMillian Singers and Elmer Iseler Singers pay a musical homage to the work of Ruth Watson Henderson. I am intrigued by the biographies of the L’Ensemble vocal Ganymede, L’Ensemble vocal Sainte-Anne Singers, Concerto Della Donna, the Ottawa Bach Choir, and Siren Women's Choir. I will be curious to hear their choral voices as well. The Missa Gaia should also be quite the show-stopper with over 120 voices performing the work under the direction of Matthew Larkin. Furthermore, you can probably expect to see me at every concert on Saturday. 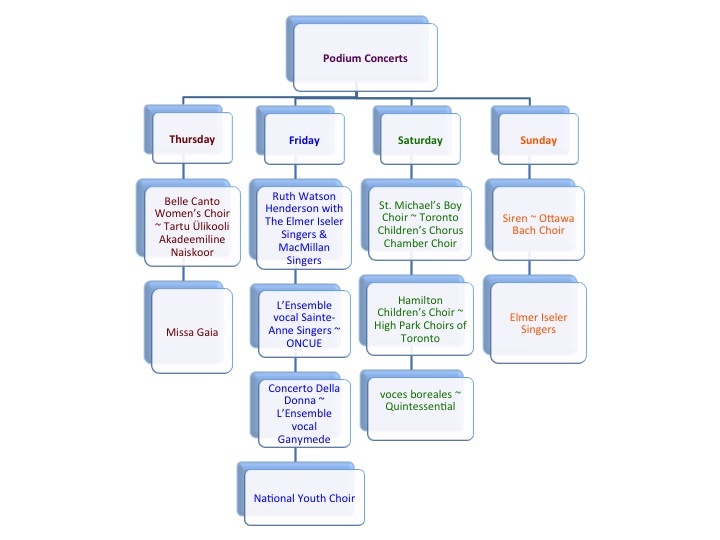 While I have heard many of these choirs, voces boreales, Quintessential, Hamilton Children’s Choir, High Park Choirs of Toronto, St. Michael’s Boy choir, and the Toronto Children’s Chorus Chamber Choir, in recordings and on CBC radio, I have yet to witness live performances from them. It’s quite the luxury to have them all performing on one day. Of course, I think one of the concerts to see and be seen at is the National Youth Choir (NYC) performance. Even though I will be weeping silently inside while attending this concert (I was accepted into the NYC but had to decline due to other commitments), I won't turn down the opportunity to support my fellow youth choristers. After giving my figures another glance, I think my attempts at developing a plan of attack may be futile. I will merely let these diagrams serve as an outline of choral possibility and be open to whatever opportunities come my way. 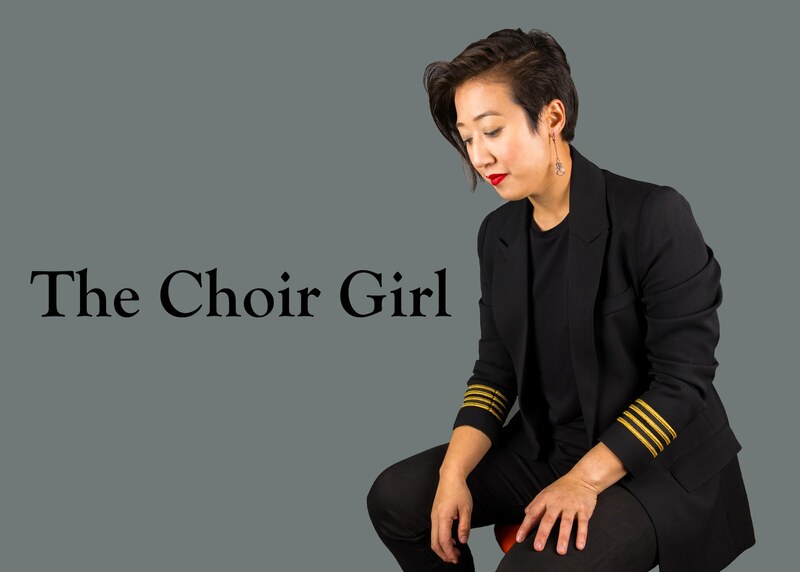 Whether that is scheduling some blog interviews with session speakers or choristers, speaking with new choral friends in the lobby of the Lord Elgin Hotel, or having coffee with a blog reader, I’m ready for all choral possibilities.